Despite possessing a catalog of mixtapes and EPs that stretches back to 2010, New Jersey rapper Da$h didn't drop his formal debut album, "Loose Skrew," until December of last year. An underground favorite known for his work with stars like Earl Sweatshirt, Action Bronson, Vince Staples, and A$AP Mob, Da$h failed to draw a crowd of more than 40 to The Riot Room on Wednesday night. Likely due to the low turnout, about a third of his 40 minute set consisted of Da$h asking his DJ to play songs by other artists as he danced around the stage. He also joked repeatedly that he only came to Missouri due to his love for the show Ozark. When Da$h was holding the mic, he performed a set mainly of tracks from his new album and the fan favorite tape "V.I.C.E.S." Da$h's devilish smile hung on his face and his foot rested on a monitor as he kicked out his comfortable, yet aggressive weed raps best exemplified on "Swordfish" -- one of the few performances that truly stuck out with help from its luxurious A$AP P On The Boards beat. After growing tired of antagonizing the crowd from the stage, he hopped down onto the floor and kickstarted an endearingly clumsy moshpit during "The Plan." 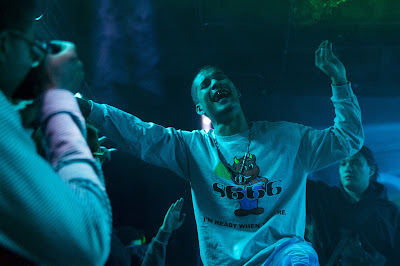 Da$h was preceded by an unannounced set from his friend and fellow Hz Global rapper Man-Z, whose performance was nearly half an hour of similarly gritty bars over cloudy instrumentals. Dettsa opened his set with "Rari" -- the quick-moving single he shares with fellow opener Sahvannes. Other than his fiery verse on that track and -- with some crowd participation -- the hook of "Go Crazy," Dettsa's set was primarily a subdued one. Its most impressive moment came at its close when he yanked a stool from the side of the stage and rapped his heart out on "Crucify Me." The track's twinkling keys and the conviction in Dettsa's voice made it feel as if it were the gripping, intimate finale of a sold-out headlining gig. Sahvannes' set came and went in a speedy 15 minutes, but included singles new and old, along with at least two unreleased tracks from his upcoming debut mixtape, one of which memorialized the late Lil Peep. The night's first set came from Kid Zee. Zee and his hypeman built an energetic foundation during their last minute set, but were doomed by Zee's often-robotic delivery and lack of personality.